North Korea held a massive parade in Kim Il-sung Square in Pyongyang on Sunday morning to mark the 70th anniversary of its founding as leader Kim Jong-un and senior officials and a handful of foreign dignitaries looked on. The regime did not display any intercontinental ballistic missiles or medium- and long-range ballistic missiles at the parade, which lasted an hour and a half, mobilizing some 12,000 troops. Instead, it displayed chiefly conventional weapons such as new KN-09 300-mm multiple rocket launchers and 152-mm self-propelled guns. The absence of ballistic missiles was an apparent nod to the denuclearization efforts of the international community. "North Korea's allies, such as China, Russia, Cuba and Syria that dispatched senior envoys, would have been embarrassed if ICBMs had been displayed," a diplomatic source said. Contrary to expectations, Kim did not give a speech. Kim Yong-nam, the titular head of state, who delivered a speech on his behalf, stressed the need to achieve economic goals rather than emphasizing the nuclear force, AP reported. He also urged the military to "to be ready to work to help build the economy." 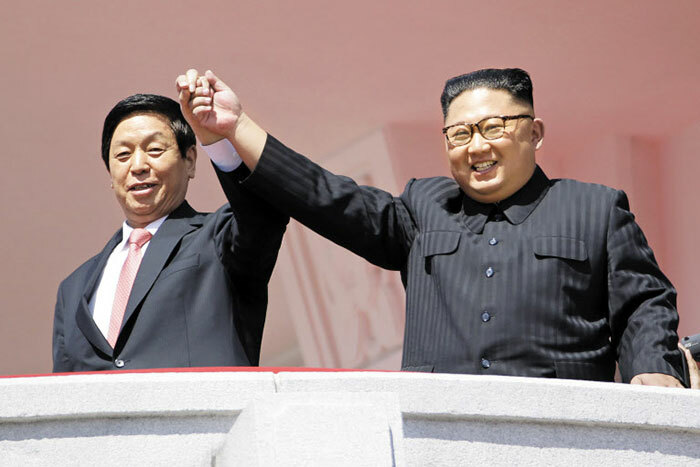 There is speculation that Kim Jong-un deliberately avoided the opportunity to mention the denuclearization issue. 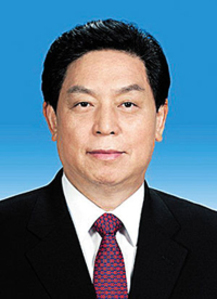 By his side was Li Zhanshu, the chairman of China's National People's Congress, who was visiting Pyongyang as Chinese President Xi Jinping's special envoy. The leaders of China and Russia sent congratulatory messages that made reference to "regional peace and stability." Li delivered a letter from Xi at a separate meeting with Kim that day, Chinese state media reported, and paid his respects at the Kumsusan Palace of the Sun, where the embalmed bodies of regime founder Kim Il-sung and former leader Kim Jong-il lie in state. Valentina Matviyenko, the chairwoman of the Russian Federation Council, also delivered a letter from President Vladimir Putin to Kim the previous day.